To enhance your skills and productivity in art, you need to invest in the best tools. The Best Wacom Tablet offer a seamless experience and enable you to move your career or hobby to greater heights. These tablets have gained fame in the graphics industry for the awesomeness and efficiency that its users enjoy. The key issue is getting the right tablet for the right purpose and at the right and comfortable price. Whether you are a beginner, a professional designer or photographer or you are just doing art for a hobby, and you are on the right truck. This article has something for everyone. Let's jump to know how to choose a Wacom tablet and which factors to consider when choosing the one? Then we review the top & best Wacom tablet of 2017. So, come in front! The quality of the screen resolution will make or break your art. A high definition quality screen is highly recommended to bring out high-quality artworks. In addition, you have to choose a tablet that displays remarkable clarity with superior color quality. This will not only inspire your artwork but also enable you to focus more on delivering quality designs. The wideness of the screen should also be considered. For professional purposes, a wide screen size is efficient as it makes it easy to navigate, scroll and zoom and most importantly to sketch, paint or edit photos on the screen. A small size screen is tedious to work on. This is because creating lines, for example, the thinner and finer lines on sketches may not be comfortable unless you zoom in the design to have a better view. Reasonably, the most expensive tablets always come with the best quality and awesome features for your career or hobby. Also, the best tablet is an affordable tablet that you can purchase without drying your wallets. Lucky for you, there are a wide variety of tablets in the market that come with a good price and the best features you can wish for. When purchasing Wacom tablets, you should consider the type of work that you want to perform. To avoid regrets and disappointment, you should also consider the amounts of work that you want to put in. There are varieties of tablets with work such as painting, sketching, editing photos among others. Also, the tablet you choose depends if you do photography or graphic design as a hobby or professional work. Hence features on the gadgets should quench your desires. The tablet should be efficient enough to accommodate the necessary software such as creative design packages. This will be depicted by the computing power of the tablets. Working on them should also be easy, with the availability of shortcuts and customizable keys to suit the desire of the users. In addition, the pen should be sensitive enough to draw, sketch or paint faster it every tap or pressure exerted on them. Everyone has different ways and tactics of working. While drawing or sketching, some people may prefer to stand, while others may want to sit or place the tablets on their laps. Good tablets should be flexible to adjust to any position that suits the user. The best tablet may also come with a rotating stand that will enable you to have various angles of view to your preferred work position. 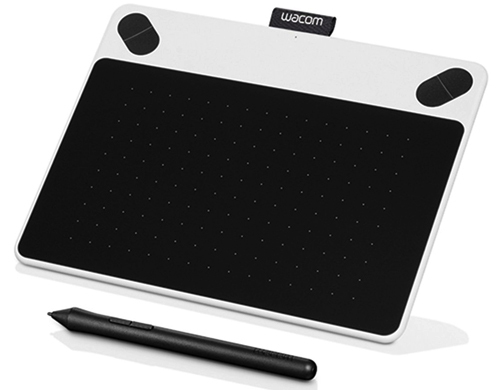 To choose a Wacom tablet you must need to consider these factors. Now we see the top & best Wacom tablet reviews. I recently completed my studies as a professional illustrator, and I needed a drawing tablet to kick off my career with. Being fresh in the market, I needed an affordable drawing tablet that would outstandingly create and bring on digital artworks. A gadget, so powerful to enhance my fresh skills is what I desired. I got exactly what I wanted. Small Intuos Professional pen is the tablet. The sizeable eraser and pressure sensitive pen make it easy to design. For a long term use, you get the best tablet with a flared design and rubber grip for comfort. I handle a lot of client's needs within a few hours hence beating the deadlines. The tablet is easy to use. The buttons can be customized to match your needs. In addition, software download instructions are provided hence you can use the best software to enhance your skills and artwork. Buttons can be programmed to do anything you want. Nibs on pen wear off faster. Perfection is my middle name. Being an artist doing my best is obvious, but perfecting my work is a rule. With Intuos Medium, I can keenly work on my artwork, by zooming, scrolling or navigating on it to ensure that every shape, object or effect is in its place. Thanks to the multi-touch surface and gestures that help me to make my artwork appealing. Besides, the tablet has enhanced my creativity and photography skills. I can edit photos and create digital artwork in the most professional way. I am proud of the top notch quality and display that the gadget gives me. I love the natural feel that I get when using the tablet. It is just like drawing on paper. I give credit to its matte finish. My career is now at its peak for I get to incorporate Photoshop CC, Painter 2015 and Corel Painter to produce digital and lavish artwork. It’s a best wacom tablet for photoshop in my eye. Are we there yet or what? The display and artwork is already top notch with Wacom Intuos Pro large. This adorable workhorse gives me goose bumps, a feeling of greatness and success in photography. It edits my photos perfectly and makes them so natural and real. The large size is perfect for display of images. Editing is even fast and easy as I get the best view of every detail in my photos by zooming and scrolling on them. Besides its fantastic pressure sensitivity on the pen, the tablet is easy to use; hence I get to edit photographs with no hitch at all. Digital painting on this tablet is also fascinating. What attracted me to purchase the tablet is the free downloadable creative software. You know how hectic it is to find software that that can perfectly match and work with various gadgets. I am glad I could download Adobe Photoshop Elements II, Autodesk Sketchbook Express, Anime Studio Debut 8 and Corel Painter among others. You are a fresh digital artist. Still young in the field but ready to explore; I was once there. I know what confuses a lot is choosing the right gadget to start with. Well, I understand the desire to get the best Wacom tablet. 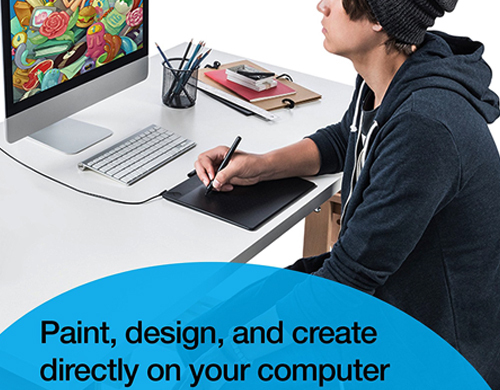 Wacom Intuos Draw is perfect if you want to draw, edit or paint. Apparently, there is so much skill you ought to get to remain relevant in the competitive market. Hence, you need an easy to use a tablet. 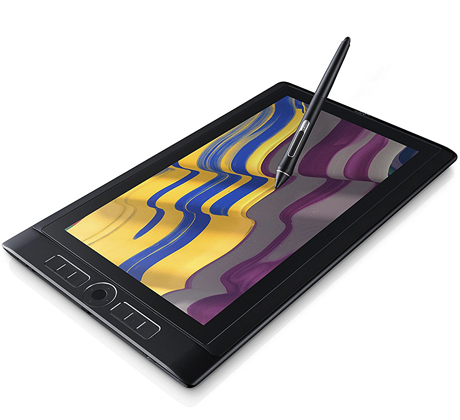 This tablet comes with a pressure sensitive pen that helps you draw thicker or thinner lines depending on the artwork. This is made possible by how hard you push the awesome pen to produce the results. The tablet comes with free handy packages for you. Yes, free! I like free stuff too. A draw pack including Artrage Lite, Sketching and drawing software and tutorials are included. Besides, the software is compact with a full range of art supplies. 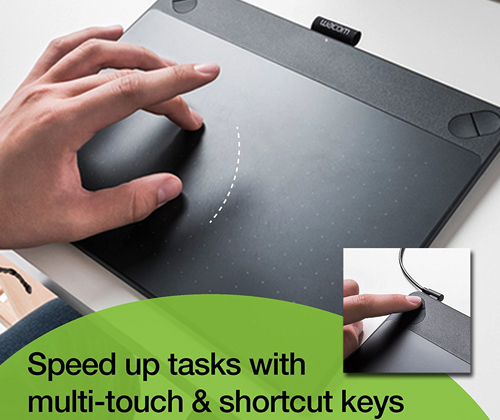 Setting up the gadget is easy hence you get to start your work so fast. Professional artists will love this. We need the best tools to make our work stand out. 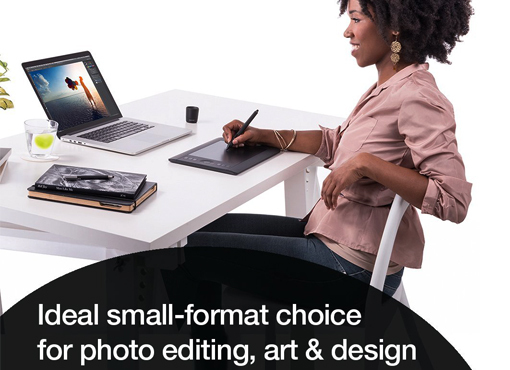 Wacom Intuos Art (Small) contains all the best packages necessary for you. It’s one of the best Wacom tablets for artist. From software, tutorials and quality pressure sensitive pen, to make work easier. Remember those times when you want your illustrations to come out in a unique way? The illustrations that are stuck in your mind but bringing them to reality seems impossible? The times that you wish designs can be made by word of mouth because apparently your thoughts design illustrations better. If you can vividly recall those moments, then you have been using the wrong gadget. Wacom Intuos Art (Small) brings your imaginations to reality. Its pressure sensitive pen will help you to sketch, paint, design, and edit in the most professional manner. Your paintings and designs will look more natural and attractive on the high-quality resolution display it provides. You work directly on the computer. This is the moment I have been waiting for my entire life, turning my computer into a digital drawing canvas. Wacom Intuos Art (Medium) is the dream. It replaces my mouse; amazingly, it is flexible and simple to use. I just draw directly on my computer so effortlessly. Its artwork is super fine and of top notch quality. I get to draw amazing sketches with the remarkable pressure sensitive pen. The freedom that the tablet gives me makes the tablet worth a thousand purchases. I get to scroll, zoom and navigate my artwork using my fingers. I have customized the expresskeys and created shortcuts like a copy, paste, redo or undo. These shortcuts have enabled me to finish given tasks in a limited time given. Designs can be made directly into the computer. Efficiency is my other name for Wacom Intuos Comic. Drawing on a digital canvas is a stride ahead on my career. If you have been having complications using a mouse, then you are going to love this tablet. Setting up the canvas is effortless, just plug it in, and install the software you want and head starts working with no hitch. The pressure sensitive pen makes it more effortless to use. A simple tap on the canvas and you access the tool and start drawing. The quality of the drawing is depicted by the natural lines and shades made by the pen. The harder you press, the thicker the lines. You will just feel like you are drawing on paper. The tablet has been as significant to me as I am a layout designer. The ink quality to the free creative packages such as creative software and tutorials has made me love my work a hundred times than before. 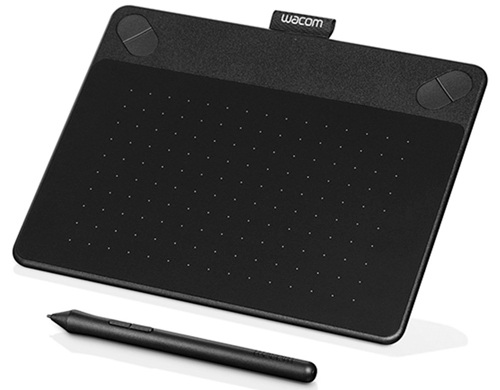 If you want to get a clear design of comics, this best Wacom tablet is a perfect for you. Software easy to set up. Variety of effects for illustrations. Not suitable for the left handed. Indeed, a picture is worth a thousand words. Wacom Intuos Photo makes your photos so natural, beautiful and lavish. You can create adorable photo books, cards, and crafts with this tablet. With the easy to use and pressure sensitive pen, the quality images you create will surely tell amazing stories. Using a tablet is a breeze. First with the simple set up, convenient navigation with fingers and then with the pen that draws perfectly with a simple tap. The tablet replaces the mouse, and amazingly, it turns your computer into an easy to use digital drawing canvas. In addition, the tablet is packaged with free photo packs such as tutorials and photo editing software. Replaces mouse hence to can draw directly on computer. As an artist, I am a complicated human with a powerful creative and an imaginative mind. I am glad Intuos 3D captures the complex yet so natural designs and ideas that I wish to unleash. According to my research the Intuos 3D is a best Wacom tablet for lightroom. ​The pressure sensitive pen works naturally, and its fine lines that it draws bring out my illustrations perfectly. Using the tablet and software that it comes with is so simple, thanks to the online tutorials provided. The tablet comes with user-friendly Zbrush core software. It is so amazing that I get to sculpt and paint my 3D art digitally. With the keys that can be customized to suit my needs, working with Intuos 3D has made my purchase the most important one. I must say, 3D is a fantastic world to explore. Convenient as it comes with software and tutorials. 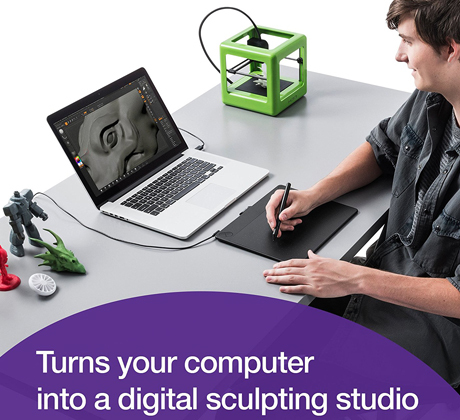 Turns computer to a digital sculpting studio. As easy as drawing on a piece of paper, Wacom Cintiq 13HD enables you to enjoy the digital feel of working directly on screen. Imagine such a sweet experience. You get to use a highly sensitive Wacom Pro pen that gives the same services as the brushes and pencils that you have probably used before. The solid display is fascinating. The quality of the artwork is remarkable. What intrigues more about the tablet is the ability to position itself in different angles to get the display that you want. You get to work very comfortably and effortlessly. In addition, you can place the tablet on its display stand for a more comfortable view to work on. Work is made easier and time is saved with the express keys that can be customized to suit your needs and instructions. The lightweight tablet is the best gadget that you can purchase in your entire career. I love the actual feel and accuracy that Wacom Cintiq 22HD gives me. It's comfortable wide size is awesome for displaying my art. The pen gives accurate sketches and gives instant feedback on every tap. This makes it simple and efficient to use. The satin-type finish on the screen makes working on it as easy as drawing on paper. Yes, you can sketch, paint, design and edit directly at the surface of the screen with no hitches at all. 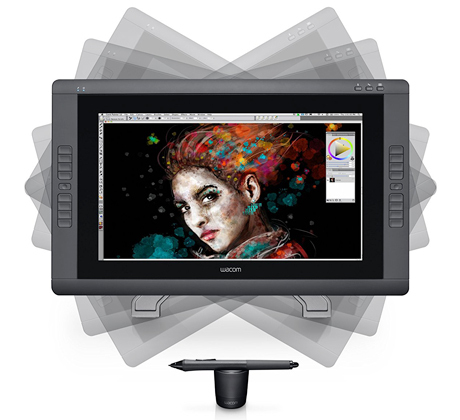 What impresses most about Wacom Cintiq 22HD is its flexibility to adjust. It makes me draw comfortable and at ease. The shortcut keys and buttons are well placed and easy to use, hence making my work fast. Above, the quality of the artwork produced is top notch. I am more creative when working on a landscape workspace. 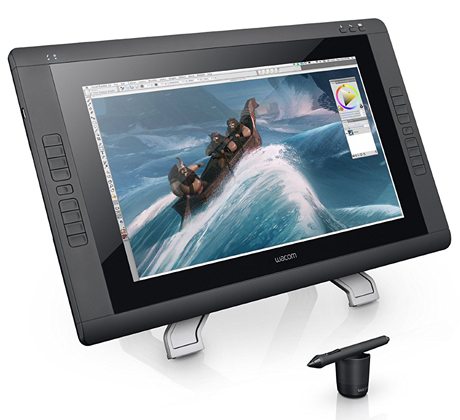 Proudly, Wacom Cintiq 22HD Touch is built with a traditional rotating stand that offers landscape and portrait viewing angles. 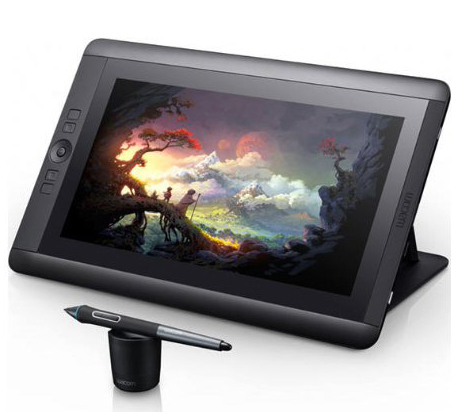 If you want to get a best Wacom tablet with screen I’ll suggest Cintiq 22HD Touch. The tablet gives me a lot of freedom. I can adjust my workspace to a desired position. 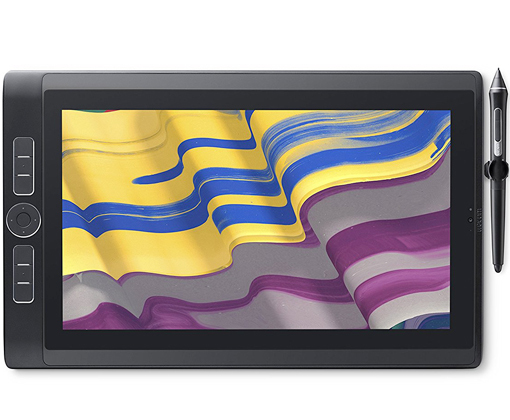 The tablet gives accurate and high-quality artwork with amazing colors. The high-quality resolution of the screen enhances the super color clarity and makes the artwork so conspicuous and beautiful. Speaking of displays, the ample screen size does a tremendous job with my designs, especially when showcasing them to the clients. The tablet also gives me much freedom to edit my designs as I can zoom, scroll or rotate my designs in all angles that I wish. This is made possible by just diving both hands to the artwork to perform the magic. Remarkable work is done with remarkable tools. Wacom Mobile Studio Pro 13 Core i7, 256GB enables you to enjoy the best clarity, resolutions display and awesome colors ever. Professionals in this field will agree that they totally enjoy the freedom and efficiency that this tablet gives them. The accuracy that the pressure sensitive pen gives is on point. This enables you to create designs in 2D, 3D and CAD software with no difficulty at all. You are also able to capture 3D scans with the aid of Intel Realsense Camera that is integrated. Efficiency is a plus with this tablet. It features customizable Expresskeys and multi-touch controls. Basically, you can program the keys in your way to do the functions that you want, for example, undo, copy or paste, hence making your work easier. This digital art tool comes with an outstanding brand quality that rocks design world. 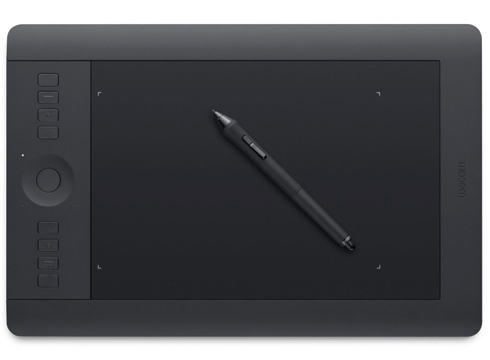 Wacom Mobile Studio Pro 13 Core i7, 512GB enables you to draw smoothly and naturally with no parallax errors or strains. Drawing directly on the tablet makes it even more exciting. The tablet is responsive and makes drawing a breeze. The lightweight and pressure sensitive pen enables you to draw fine and thick lines accurately, bringing out an excellent art. The colors are amazing, displayed on a high definition resolution screen. I am very certain that all commercial artists will love it. The tablet provides tireless work, thanks to the professional computing power that enables it to run creative software applications. Hence, the artist can enjoy a variety of software that the tablet supports at their convenience. 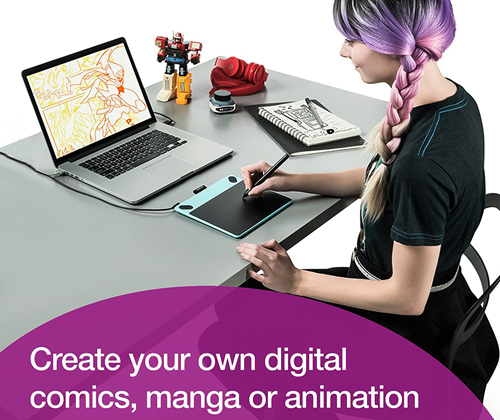 Nothing motivates more like having the best digital graphics and drawing tablets for your career or hobby. This inspiration comes from the good quality of art that you get. With the above Wacom tablet reviews, you get to explore your skills to your full potential. The accuracy, efficiency, affordability and the exceptional performance that the tablets present are renowned far and wide. In addition, each and every tablet has specific features that will suit your workflow needs. Investing in the best Wacom Tablets is the greatest favor that you will do to yourself for you will never get disappointed. If you want to be a professional artist, you must follow the below guidelines. Best drawing tablet in 2017 review & guide.